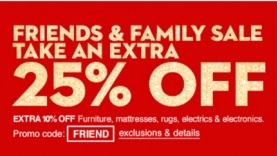 Enjoy extra savings from Macy’s Canada. Take an extra 25% off your online purchase on the official website! Use promo code FRIEND at checkout to receive the offer. The code can be used on already reduced items. Offer is valid through 12/10/2015. Official source of the information is Macy’s Canada. More details about the promotion available online.